I'm heading to camp this weekend for Young Life Winter Weekend!! 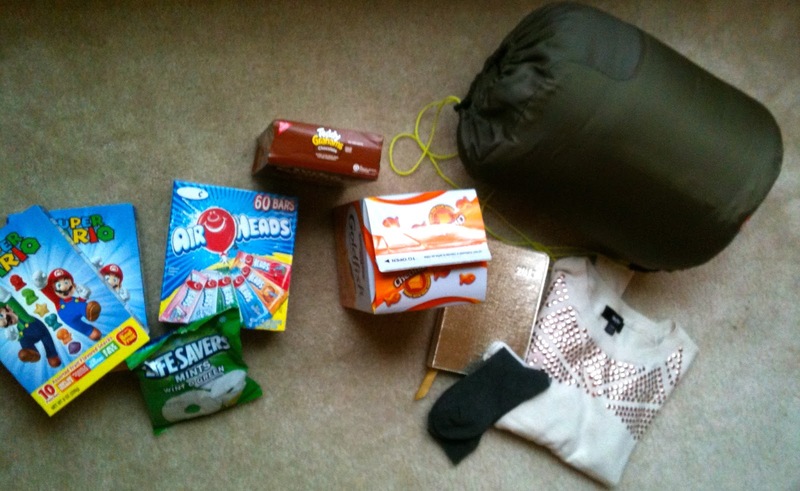 So I had a few things I needed to pick up for the trip and for my cabin. Plus I'll take any excuse I can to go to Target. I have to have a specific purpose in mind when I go to Target, I can't just go for no reason at all, or bad things happen to my wallet. I also wanted to load up on some junk food for the cabin. I probably should have eaten dinner before going shopping because I was feeling a little wild in the snack food aisle. Of course before I went looking for the actual items I intended to buy, I stopped in the clothing section (which is right at the front of the store making it impossible to skip) and ended trying on about 20 different things. In the end I restrained myself and ended up with only one really cute sweater, plus a turquoise thermal (I needed that for this weekend of course) and some boot socks. Oh and a really shiny 2013 day planner that I'm obsessed with. And even though I never used the 2012 I bought (still sitting under a pile on my desk) I am definitely going to use this one and be super organized! I think the cashier either thought I was a 10-yr old, whose mom had let her come into the store alone, or a teen mom judging by the amount of lunch-box-worthy food in my cart. And did I forget to mention the extra box of Milk Duds I was snacking on.... You'll notice they're not shown in the picture of my purchases below because, well, I ate them all. Judge away. Fortunately you know a good dentist . teehee. have fun!